Waking up to the sound of your toddler coughing can be alarming, especially if the cough produces large amounts of phlegm. However, coughing up phlegm isn't always cause for alarm. This phlegm may be caused by the common cold or other viruses. In rare cases, it may be due to an underlying medical condition such as respiratory syncytial virus or pneumonia. Call your pediatrician if your child has difficulty breathing, chest pain or a fever for more than 3 days. Coughing can be caused by several conditions. If your toddler's cough is productive and usually gets worse at night, it is probably related to a cold. Although asthma can also cause nighttime coughing, the cough is usually not productive. Although coughing up phlegm can be linked to a bacterial infection, usually it indicates the beginning of the common cold. At night, mucus drains from your nose and sinuses into your throat, which irritates the lining and causes coughing. Other less likely causes for productive nighttime coughing include respiratory syncytial virus and other viruses, as well as pneumonia, sinusitis, a swallowed object and cystic fibrosis. Respiratory syncytial virus, or RSV, is similar to a cold and can lead to more serious infections such as pneumonia, if it does not clear up. RSV is particularly common from November to mid-March. Pneumonia often strikes after a cold and is characterized by a severe cough and fever. Sinusitis is less common in toddlers, but might be the cause if your doctor has already ruled out pneumonia. Coughing at night is often accompanied by other symptoms, which might provide clues to your toddler's condition. Keep in mind that although it might be alarming, vomiting at the end of a severe coughing spell is common because coughing can trigger a gag reflex in toddlers. If your toddler has a lot of drainage, it may drain into the stomach and cause nausea and vomiting. 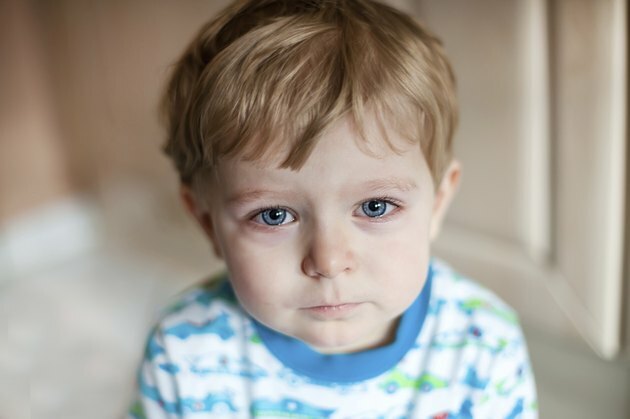 Observe your toddler for other symptoms such as runny nose, difficulty breathing and fever. Keep your toddler hydrated to help loosen phlegm, and use a vaporizer or humidifier at night to help ease chest congestion. Talk to your doctor about adding a few drops of lavender or eucalyptus to a pot of hot water and allowing your toddler to inhale the steam to loosen congestion. If you toddler experiences wheezing, fever for more than five days, blood streaks in phlegm, difficulty breathing, coughing fits for more than 20 seconds or unusual lack of energy and appetite, the cause may be more serious, so consult your doctor to determine the cause and best treatment. The British Journal of General Practice: The Natural History of Acute Cough in Children Aged 0 to 4 years in Primary Care -- A Systematic Review.